Finally! A clear guide to all of those obscure weights and measures for the Victorian kitchen. From gills, to pecks, to tumblers. Butter the size of an egg has always been a bit of a mystery. 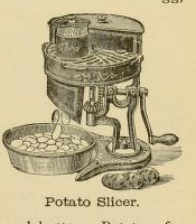 Source: In the Kitchen, 1875.